WASHINGTON -- The Trump administration is sending a flotilla of ships and thousands more military personnel to Puerto Rico to address the growing humanitarian crisis caused by Hurricane Maria. Only 21 of the 69 hospitals have power or fuel, CBS News correspondent David Begnaud reports from San Juan. San Juan Mayor Carmen Yulín Cruz is frustrated with what she says is a slow response from FEMA. "They're waiting for their marching orders now. You're in an emergency. If you don't do -- hundreds of lives will be lost," she told Begnaud. After not mentioning the hurricane-devastated island for days, President Trump pushed back aggressively and repeatedly Tuesday against criticism that he had failed to quickly grasp the magnitude of Maria's destruction or give the U.S. commonwealth the top-priority treatment he had bestowed on Texas, Louisiana and Florida after previous storms. Mr. Trump announced that he would visit Puerto Rico and the U.S. Virgin Islands next week. He also tweeted about Puerto Rico's needs. He talked about Puerto Rico during a meeting on tax cuts. He raised the subject at a Rose Garden news conference with the prime minister of Spain. And he attended a hurricane briefing. He called a meeting of agency heads tasked with helping Puerto Rico recover, and sent top officials, including Long, to talk to reporters. Throughout, the president stressed that Puerto Rico's governor had praised the federal response, characterizing Ricardo Rossello as "so thankful of the job we're doing." 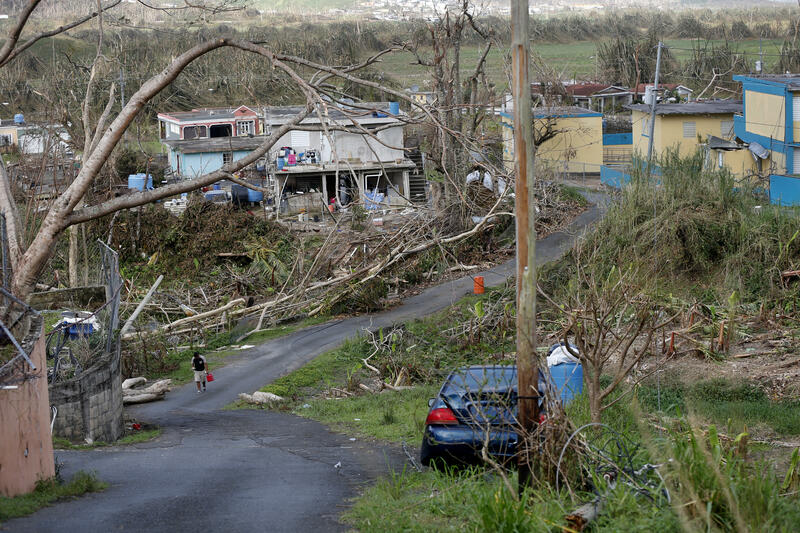 Mr. Trump, who had proposed visiting Puerto Rico earlier this month, said next Tuesday was the earliest he could get there without disrupting recovery efforts. Rep. Nydia Velazquez, D-N.Y., said she had been concerned that Mr. Trump's continued tweets about NFL players showed he didn't grasp the severity of the crisis. She warned that if he didn't start taking it seriously, "this is going to be your Katrina," referring to criticism of President George W. Bush following the slow federal response to Hurricane Katrina in 2005. "The crisis for these Americans needs more attention - and more urgency from the executive branch," tweeted Republican Sen. Ben Sasse of Nebraska, a frequent Trump critic. Florida GOP Sen. Marco Rubio concurred, tweeting about San Juan, "MUST get power crews in ASAP." The Pentagon said the number of active-duty military personnel assisting in Puerto Rico would grow from about 2,500 to possibly double that number in the next several days.